Our department offers several field schools where students are trained in up-to-date methods in field mapping, measurement, concepts, and safety. Our field schools are listed in the summer session of the academic calendar and are registered for in the same manner as our other courses. Please note that there are maximum student limits on these field schools, so you should register as soon as you can. 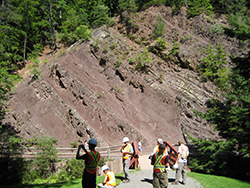 Earth Sciences Field School (ERTH 3000) is a 10-day field school run in late August-early September. This is compulsory for honours students. 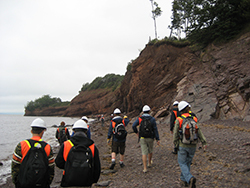 Earth Sciences Field School, based at Camp Geddie on the Northumberland Strait, introduces students to field mapping and related skills. Advanced Field School (ERTH 4002) is an advanced field school held in western Nevada and eastern California for 4 weeks in May. 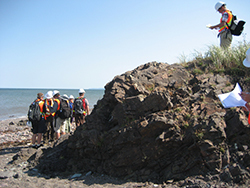 Students develop their field mapping skills and apply them to a variety of real-world geological problems. Geophysics Field School is offered at the end of April as part of ERTH 2270 (Introduction to Applied Geophysics). ERTH 4156 (Petroleum Geoscience Field Methods) includes a series of preparatory classes followed by a week-long excursion to Trinidad during study break. 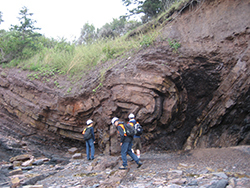 In addition, many classes include one or more field trips to a variety of locations in Nova Scotia.